If the admin password is forgotten and isn't viewable on the device, a restablecimiento completo can be performed. A hard reset removes ALL modified settings (e.g., Network Name (SSID), Wi-Fi/Admin Password, etc.) and restores default settings viewable on the external LED of the MiFi device. Wi-Fi name and password can be viewed via the LED externo or the sticker on the back of the MiFi. 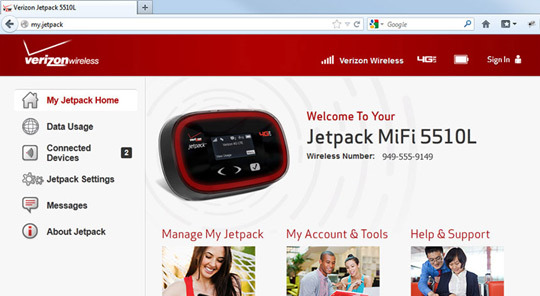 Launch a web browser, type http://my.jetpack into the URL address field then press Enter. Alternatively, type 192.168.1.1 into the URL / address bar. 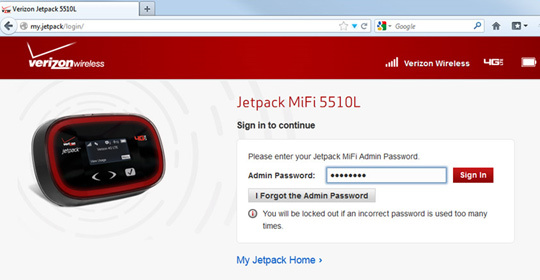 Puedes ver el Admin Password via the external LED of your MiFi device.